The attached Obituary carried in the August 23, 2012 editions of the Vancouver Sun and Province, tells the story of Lauren’s life and tragic and untimely death, and can be read by clicking on the highlighted link above. As a last gift of human gratitude, Lauren became an organ donor, and in doing so she saved the lives of 6 people and restored eyesight to 2 others. Like Lauren, we encourage you to become an organ donor – more information can be obtained by clicking onto the highlighted BC Transplant link. A touching story of the grateful recipient of Lauren’s lungs can be found on the attached 3-minute video link by Global News entitled “Transplant thank you”. 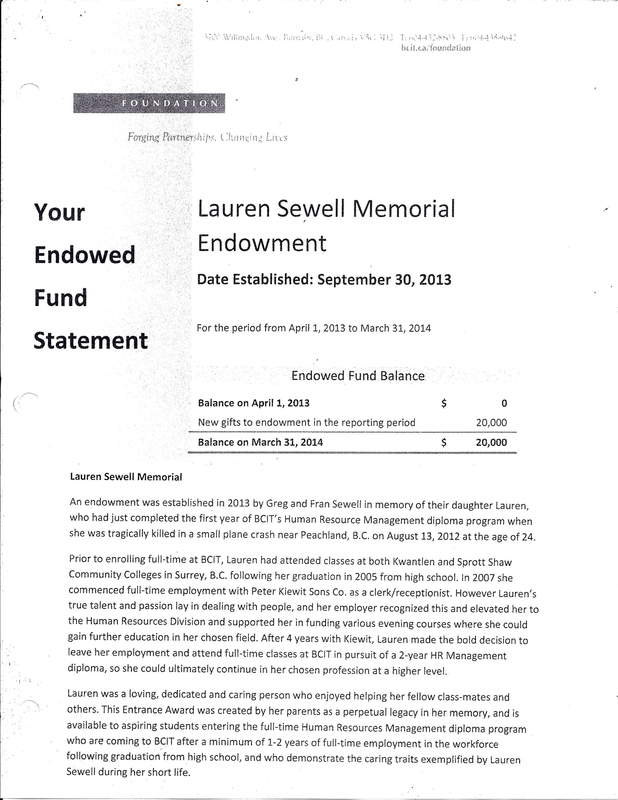 Lauren and her boyfriend Dallas Smith were both students at BCIT in Burnaby, B.C. On the first anniversary of the fatal plane crash, Lauren’s parents organized a charity golf tournament, and raised just over $40,000 to be used to establish memorial scholarships at BCIT in their respective names in the amounts of $20,000 each. 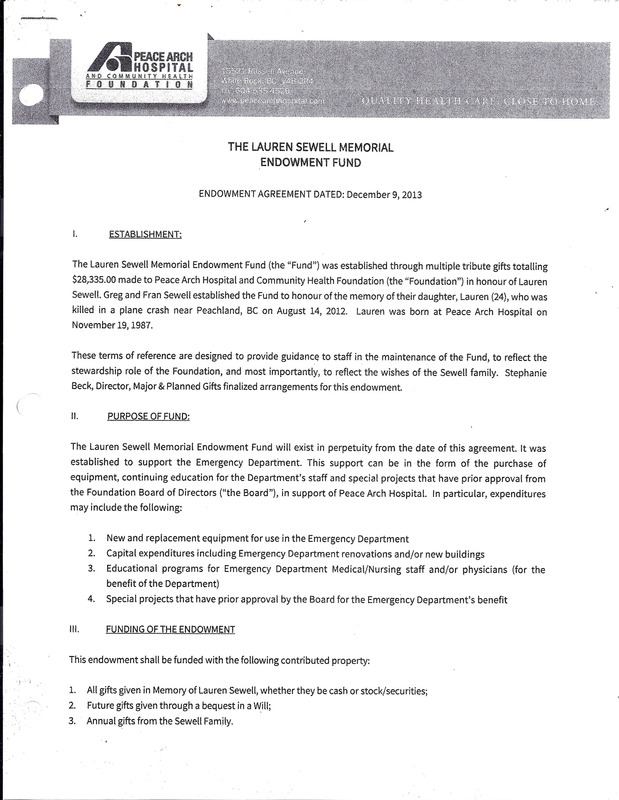 The Lauren Sewell Memorial Endowment will award $1,000 each year in perpetuity to an aspiring student enrolled in the Human Resource Management program (see attached highlighted link.) In addition, the highlighted video link entitled “Plane crash memorial” tells the story of the charity golf tournament held on August 14, 2013 in a brief 3-minute video clip produced by Global News. E. AVIATION REGULATION REFORM – T.B.D. The final chapter of Lauren’s Legacy has yet to be written, but with your help it will become a reality, so that other families will be spared the grief of losing a loved one in a preventable and survivable small plane crash. Please complete and submit our PETITION to support legislative changes to the regulations that govern small aircraft and pilot licensing in Canada.